A 10 milligram dose of the animal tranquilizer carfentanil is powerful enough to sedate, even kill, a 15,000-pound African elephant. If diluted sufficiently, a dose of the same size — the fraction of the weight of a paper clip — could also send 500 humans to the morgue. A dose as small as 20 micrograms would be fatal to humans. 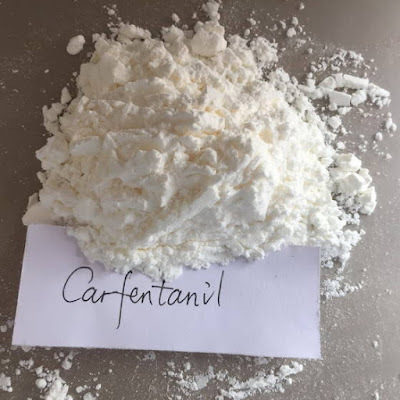 Carfentanil is an analog of fentanyl. 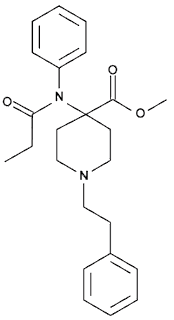 It is 10,000 times more potent than morphine and 5000 times more potent than pharmaceutical grade (100% pure) heroin, making it one of the most potent known and the most potent commercially used opioid. Carfentanil was first synthesized in 1974. 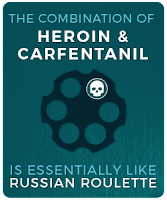 Heroin cut with carfentanil offers a harder-hitting, longer-lasting high and allows dealers a very cheap shortcut to increase their supplies. 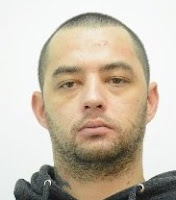 Border agents had to don hazmat suits to deal with a one kilogram package of carfentanil Two weeks ago, Mounties announced charges against Joshua Wrenn, 24, who was on the receiving end of a one kilogram package of carfentanil shipped from China. 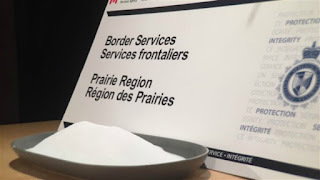 The Canadian Border Services Agency and the Royal Canadian Mounted Police said they found the drug hidden in a box labeled as printer accessories. They charged Wrenn with one count of importing a controlled substance and one count of possession for the purpose of trafficking. The package, authorities said, could have produced 50 million doses. Authories display 1 Kg of salt to show how much carfentanil was seized. Yesterday CNN reported a spike in overdoses in Cincinnati. In New Jersey 29 people overdosed between Tuesday and Thursday in Camden. In Indiana, 13 people overdosed Tuesday in Jennings County alone. In Kentucky 12 people overdosed Wednesday in Montgomery County. Heroin contaminated with carfentanil was also reported in Florida causing a massive spike in overdoses there. Like fentanyl, carfentanil can be absorbed through the skin or inhaled, and contact with even a grain could be enough to require medical attention in humans. 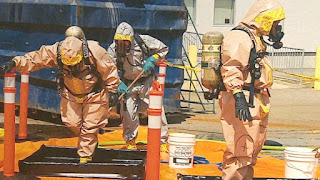 Carfentanil is readily available on-line from any number of Chinese suppliers.